HydroWorx pools are designed to be very versatile so that you may treat a wide variety of specific health conditions using underwater therapy for paralysis, stroke rehabilitation, arthritis therapy and relief. On this page are just a few of the conditions we can help rehabilitate. Don’t forget to watch the related videos to learn specific exercises tailored to your rehabilitation needs. We’ve partnered with leading institutions and invested heavily in research to support our claim that HydroWorx products are the most effective underwater therapy devices on the market today. Below is a summary of clinical research studies into common applications of HydroWorx aqua treadmill therapy — you’ll find more in the above links. 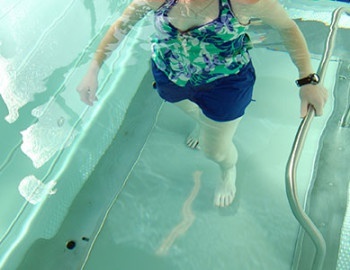 Older adults: Positive outcomes reported by middle-aged and older adults after a five week course of exercise on a HydroWorx aqua therapy treadmill included decreased joint pain, improved sleep patterns, greater flexibility and an overall improvement in physical and psychological wellbeing. The trial, which included 14 adults with a history of physical ailments, was conducted at the University of Wisconsin’s Department of Kinesiology. Overweight/obese adults: A study of 57 overweight men and women conducted at Texas A&M University’s Department of Health and Kinesiology found that underwater treadmill therapy reduces the risk of injury and perception of effort in overweight users, while contributing to improvements in aerobic capacity and body weight. Post-surgery Recovery: Athletes recovering from ACL reconstruction surgery were found to have faster recovery times and less incidences of re-injury when underwater therapy was incorporated into their rehabilitation. Osteoarthritis: A study by Utah State University Health, Physical Education and Recreation Department concluded that patients diagnosed with osteoarthritis may receive the same aerobic conditioning with less joint pain and greater improvements in mobility by utilizing underwater treadmills as opposed to land treadmills. 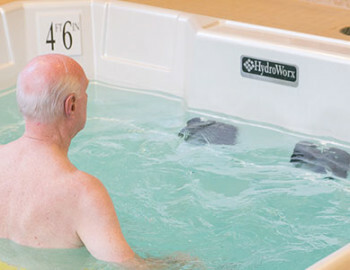 A HydroWorx therapy pool is more than just a swimming pool. Our products are built for clinicians and have incorporated a range of features that contribute to successful rehabilitation, pain management and general wellbeing. 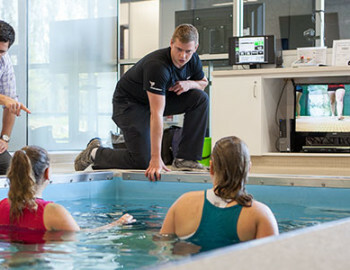 Underwater treadmills: Underwater treadmill therapy is a key component of any aquatic exercise or rehabilitation regime. Using an underwater treadmill promotes proper gait and encourages correct biomechanics while walking or running underwater. Since 1998, all HydroWorx products therapy pools have featured a built-in underwater treadmill. 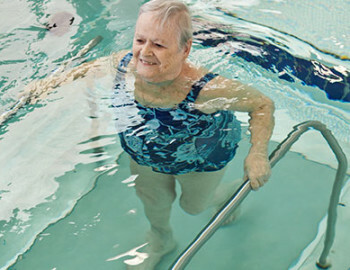 Movable floor: For patients with mobility issues, HydroWorx 1200 and 2000 series therapy pools include a moveable floor that makes it easy for children, older adults or anyone with orthopedic or chronic conditions to get in and out without using steps or ladders. All of our other pool offer safe and comfortable accessibility with large built-in steps. Deep tissue massage: All HydroWorx pools have built-in deep tissue massage capabilities with a hose attachment for the product’s resistance jets. Deep tissue massage can relax muscles and stop lactic acid buildup, reducing soreness, and promoting faster recovery. We service what we sell. If you have an issue with one of our products, our team of trained technicians are available in-person or over the phone for immediate support — 24 hours a day, seven days a week, we’re here for you, just like you’re there for your patients.